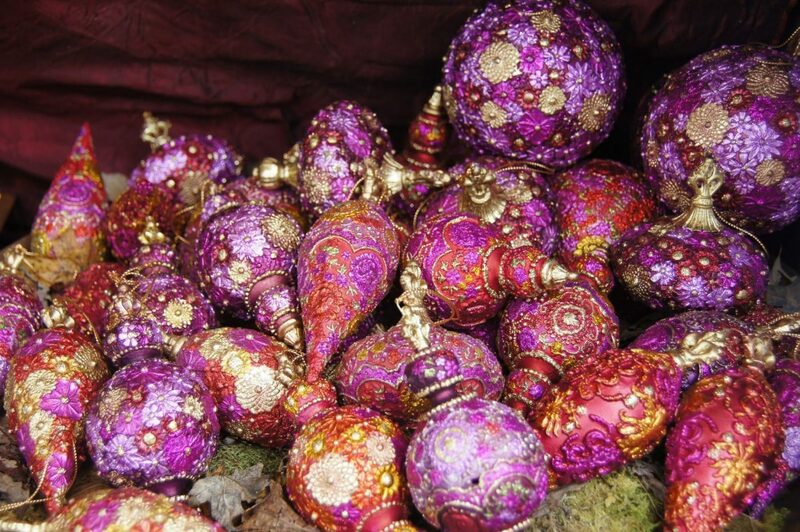 One of my favourite Christmas traditions in Switzerland is the annual Christmas markets that start popping up all over the country in early December and stay open right up until Christmas Eve. Even if I end up not buying anything, I love wandering around the stalls checking out the vendor’s wares, sipping on a steaming mug of vin chaud (hot mulled wine) and listening to the Christmas carols playing in the background. Sadly, Geneva doesn’t have a very impressive Christmas market for some reason. The nearest big market is in Montreux, about an hour away by train, and Nick and I always make a point of going there every year. I do still love the Montreux market, but it gets incredibly crowded on the weekends, and after going there a few years in a row I’m at the point where I can list off most the market stalls by heart (the wine bottle holders, the homemade jam, the chocolate formed in the shape of hammers, wrenches and other handyman tools, etc.). 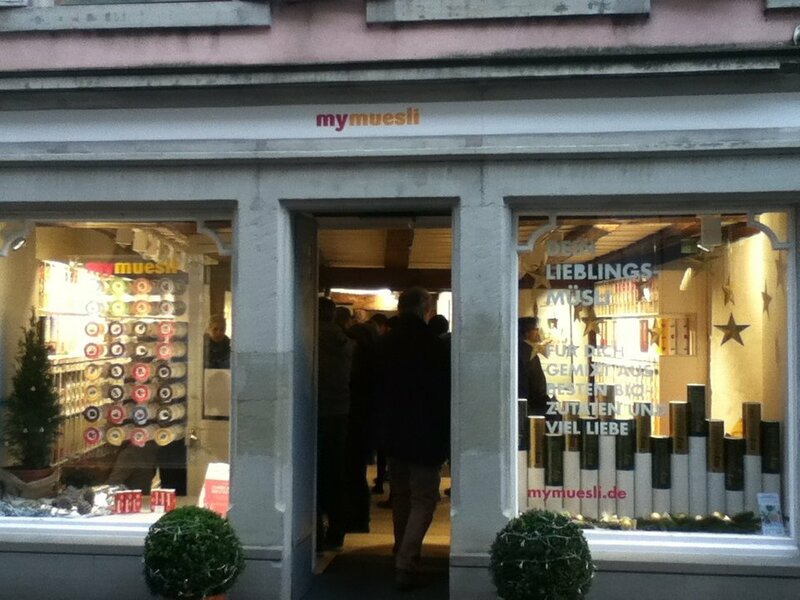 So, this year we decided that we would also take a trip further afield to the market in Constance, Germany, just across the border from Switzerland and about four hours from Geneva by train. In fact the Swiss rail company, SBB, was offering a promotion that included half-price train tickets to Constance and a mug of vin chaud (or glühwein as they call it in Germany), which seemed too good to pass up. At least I thought we were getting a mug each of vin chaud, but as it turned out we also received a one-litre bottle of the stuff to take home and another one-litre bottle of fruit punch. EACH. 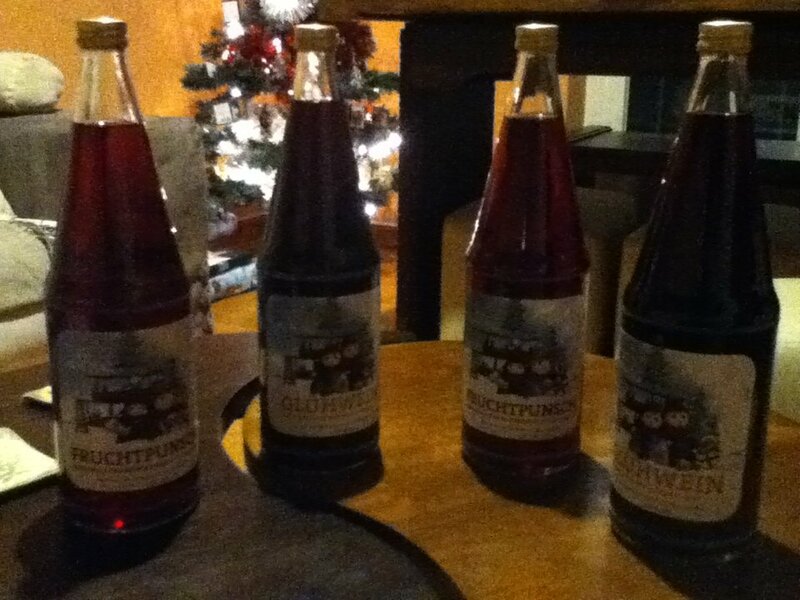 So no chance of running out of drinks at Christmas dinner this year! Before I describe breakfast at the hotel, I need to make a confession: I am obsessed with oatmeal. At home in Geneva I eat oatmeal everyday if at all possible. That might sound boring and repetitive, but actually it’s quite the opposite. There are so many different things you can do with oatmeal! Firstly, there are rolled oats and steel-cut oats, which are two very different experiences. 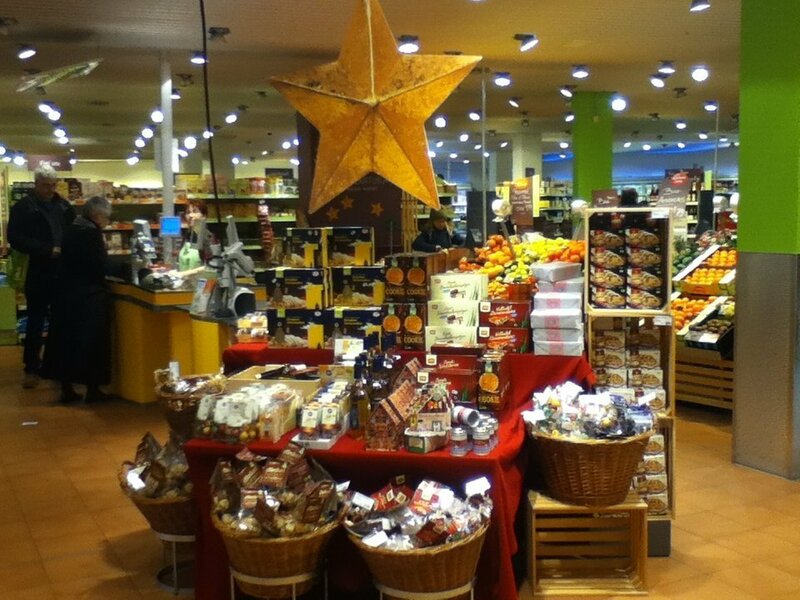 And then, in addition to all the different fruits, spreads, spices etc. you can use to flavour the oats, there are also a number of different ways to cook them. You can cook them on the stove top, which is the most traditional way. You can purée them in the food processor beforehand with banana or avocado, which makes them all soft and creamy like pudding. Or you can bake them, which results in a lovely treat that is almost like a healthy cake or brownie. And then, if you don’t want to cook them at all, you can make what are known as overnight oats. 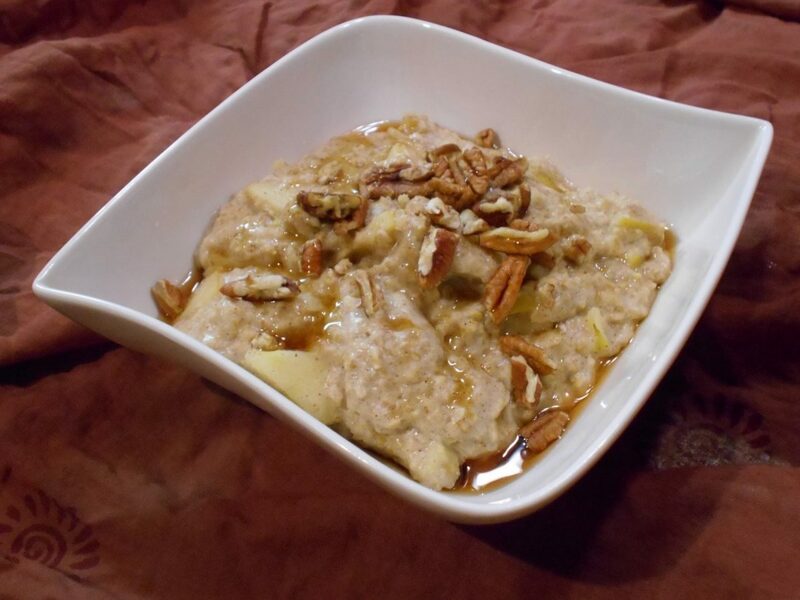 This is by far the simplest method, as all you have to do is mix the oats with some kind of liquid and whatever fruit or other topping you wish, and then let them sit in the refrigerator overnight. By the time you wake up in the morning the oats will have soaked up the liquid and softened enough that they can be eaten as is, cold, or heated up a bit if you prefer. Now, I’ll admit that I’m partial to the stove-top and baked varieties and have only made overnight oats a handful of times. Ever since I started this blog, though, I’ve been thinking about vegan meals that can be prepared easily on the road, for those occasions when you really can’t find anything edible in restaurants (or for when you’re on a multi-day trek or train journey and there simply are no restaurants). I have a few ideas, which I will write more about in a future post, but the one thing my mind keeps returning to is oatmeal. Of course, if you were carrying a camping stove you could just cook your own oats, but if you didn’t want to or didn’t have the room in your bag to carry a stove, what about making them as overnight oats? Do they really have to soak overnight, or would a couple of hours be enough? And does it have to be in a refrigerator, or could it sit out at room temperature? These are questions that I still need to explore. The biggest question for me, though, is what to use as the soaking liquid. At home, I always use soy milk (or occasionally coconut milk if it’s a tropical kind of oatmeal). But if this is meant to serve as an emergency meal when there are few other choices available, then soy milk is likely to be in very short supply on such occasions. So I decided this weekend I would start the first of what I expect to be many experiments with other options. Orange Dreamsicle Oatmeal! 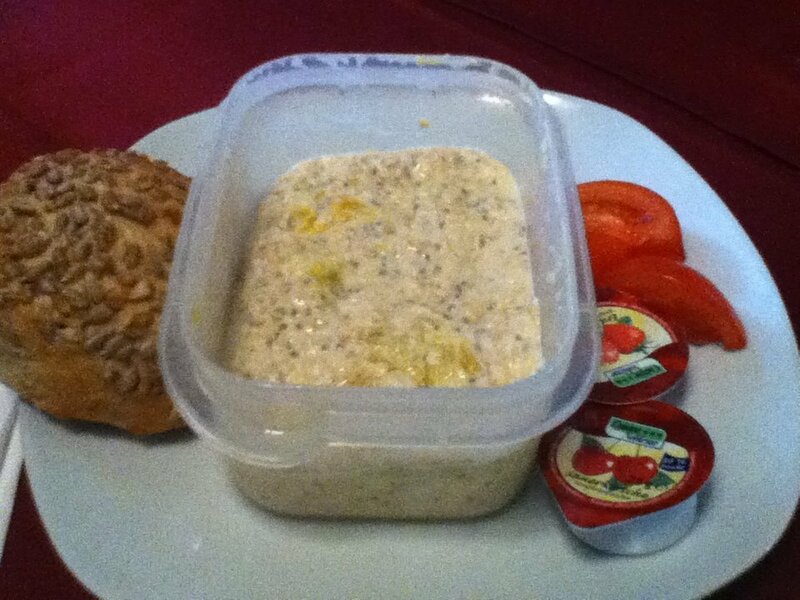 With some bread, jam and tomatoes from the breakfast buffet thrown in for good measure. Like almost all of my oatmeal recipes, all credit for this one goes to Lauren, a.k.a The Oatmeal Artist (who I also hold responsible for my addiction to oatmeal in the first place). After a lazy morning we headed to the Christmas market for a wander. 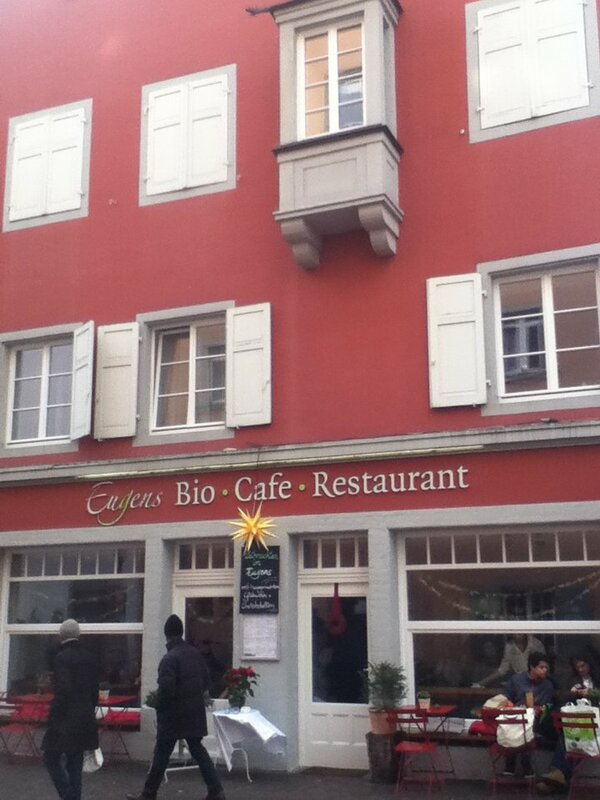 Even after warming ourselves up with some glühwein, we decided it was still too cold to eat outside at the market stalls, so instead we headed indoors to the inviting Eugens Bio Café and Restaurant, which is housed in a lovely historic building in the old town. While Eugens serves both meat and veggie dishes, the focus is definitely on healthy, organic food. There is a separate section of the menu for vegan and raw dishes, and there are several other vegan options scattered throughout the menu, all of which are clearly marked. Actually, I was quite struck by the way the menu items were labelled. Rather than using a carrot or other veggie symbol to mark the vegetarian items, they instead used what looked to me like a bloody butcher’s knife to mark the meat dishes! Hopefully this will provoke their customers to think about what’s actually on their plates. 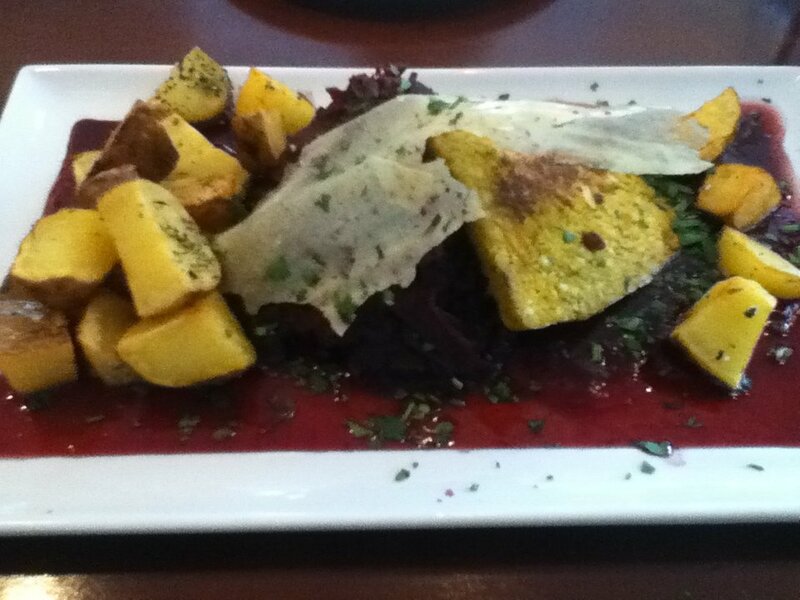 On our server’s recommendation, I chose the mango tofu steak with cranberry sauce, red cabbage and roasted potatoes. It was beautifully presented and tasted just as good as it looked. Check out that dark red colour! It was definitely appropriate as a festive meal for the holidays. 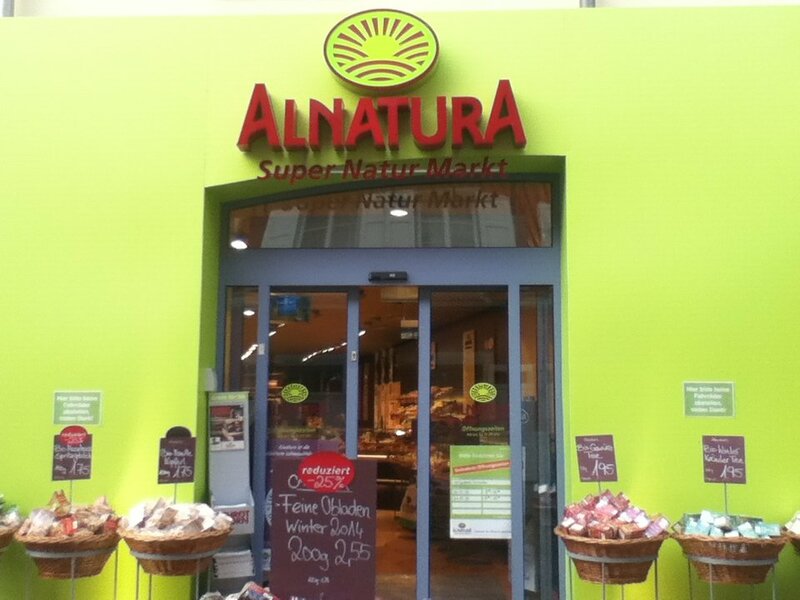 It’s also worth pointing out that just across the road from Eugens is an all-natural organic supermarket called Alnatura. And I don’t use the word “supermarket” lightly here. This place was huge! 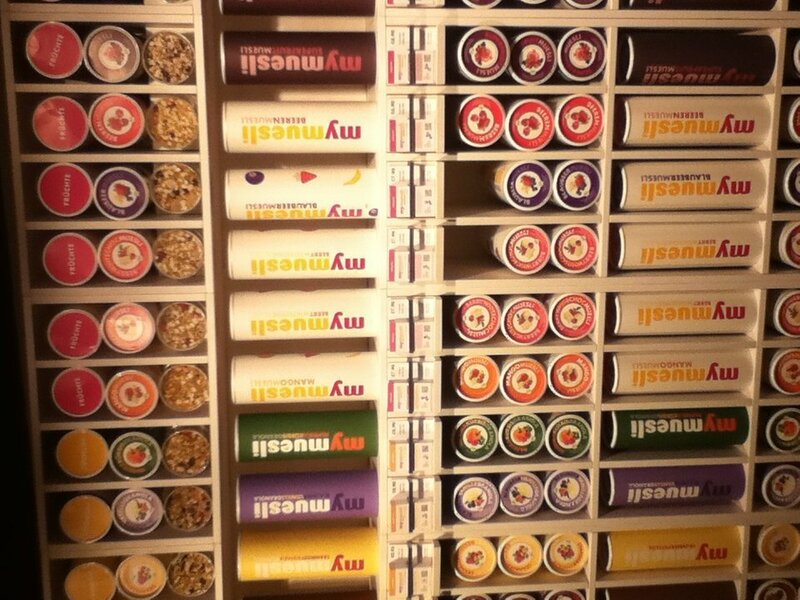 If you want to stock up on snacks or need a quick meal to take along on a train journey, this is the place to come. 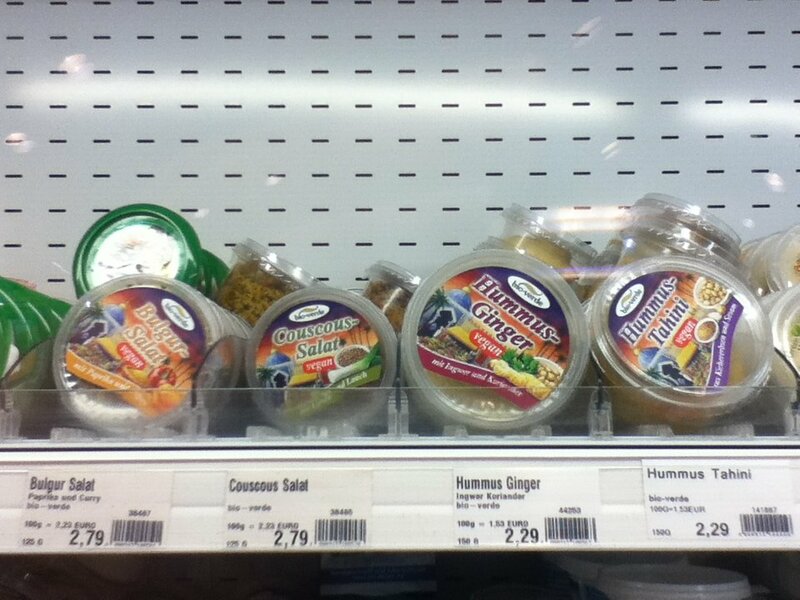 Here’s a small sampling of the ready-made vegan salads and dips you’ll find in the refrigerated section, along with vegan cream cheese, sour cream, etc. There was also a display of Christmas cakes and cookies at the front of the store, so I took a quick look to see if any of them were free of animal products. There are definitely some German/Swiss Christmas specialties that can be made vegan, like lebkuchen (similar to gingerbread) or speculatius cookies, but so far I hadn’t had any luck searching for vegan versions of these in Geneva. 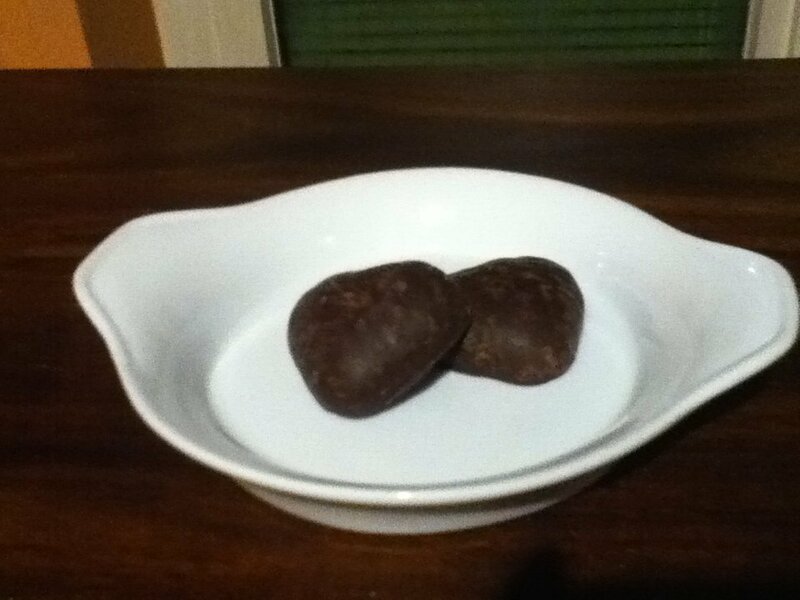 I found a bag of chocolate-covered, heart-shaped lebkuchen, scanned the ingredients list, and didn’t see any of the words I knew to look out for (like milch, eier, raum, etc.). 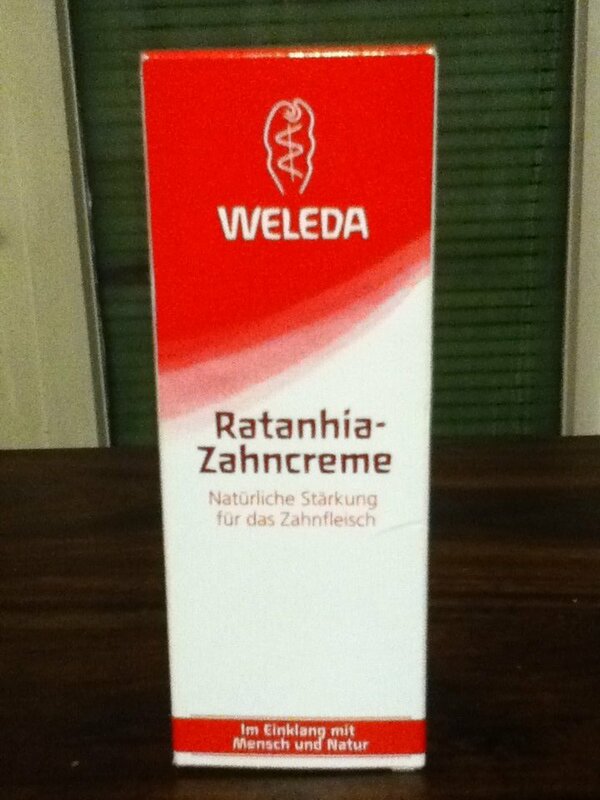 This German brand is a reliable choice for beauty products and naturopathic medicines; their website states that their products are suitable for vegans, and they offer a full range of personal hygiene products. For the record, Lavera is another good all-natural cosmetics brand that offers many cruelty-free products and is not too expensive. Most of the hygiene products I’ve purchased recently have come from Lavera. 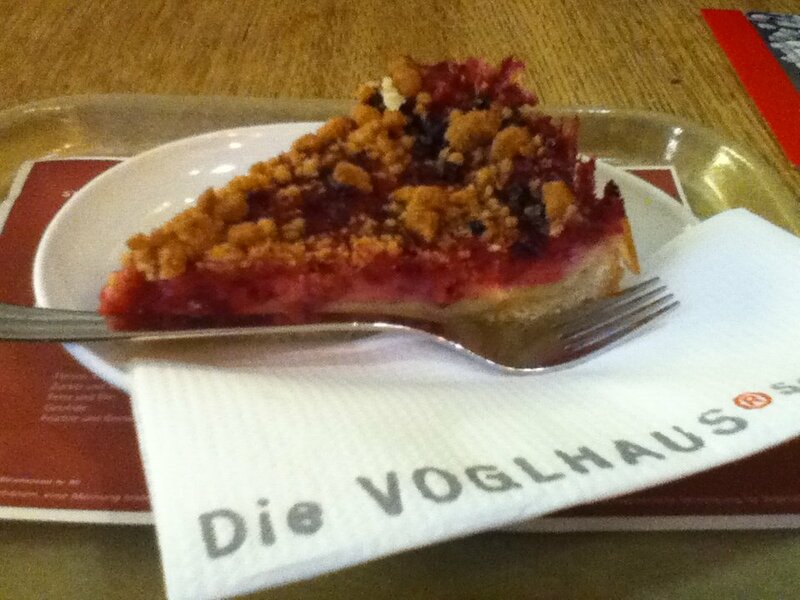 After lunch and a wander around the old town, we decided to stop in at Das Voglhaus for dessert. 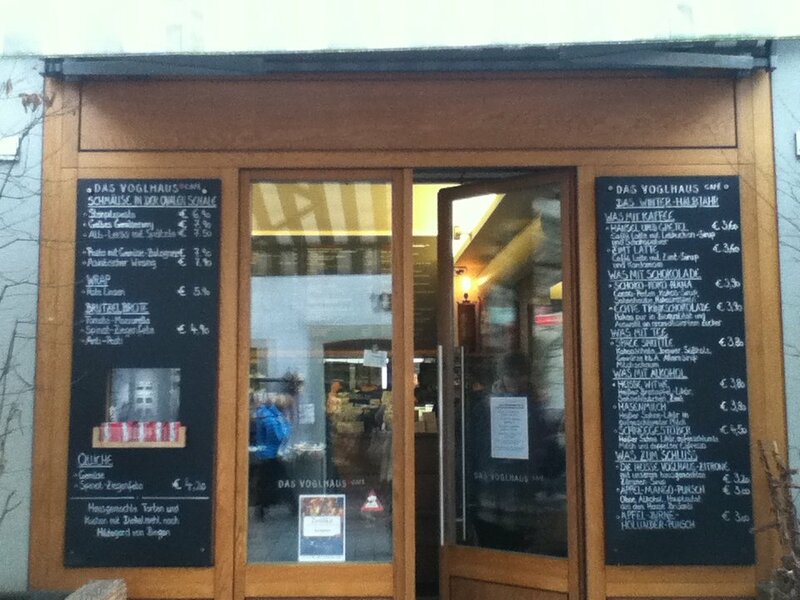 This is a very popular café with a large range of hot drinks and desserts. When I asked which desserts were vegan, the girl behind the counter was surprised to find that on that particular day they had only one vegan cake and two types of vegan cookies. She was very apologetic and said that normally they have four or five different options. I didn’t really mind though, as the one cake they did have on offer – the Früchtetarte aus Dinkelmehl (fruit tart made with spelt flour) – looked enticing and quite possibly would have been my first choice anyway. You could also have a casual meal here if you wanted, as they offer sandwiches, wraps, salads, etc. 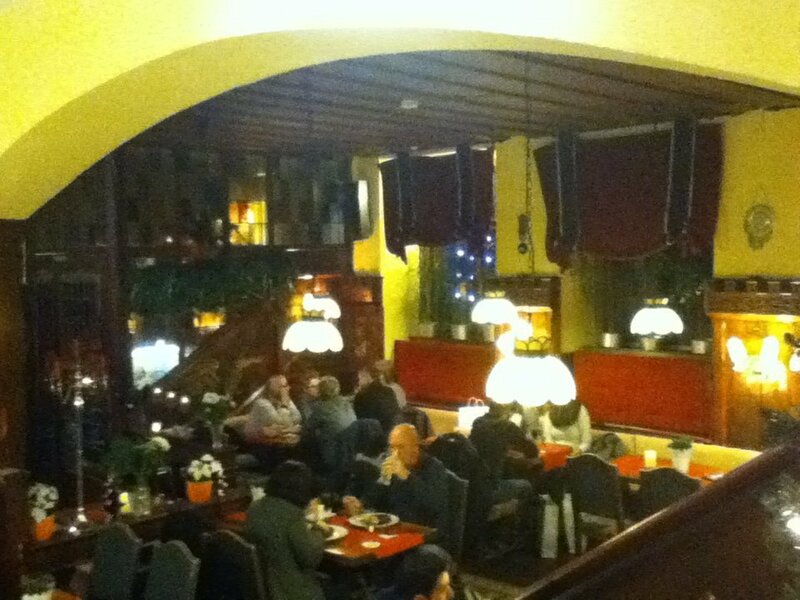 as well as a few hot veggie dishes. Most of their business seems to come from cakes and coffees though, and it’s the kind of café where you might come and linger for awhile in one of the comfy nooks near the fireplace (assuming you can snag a seat!). 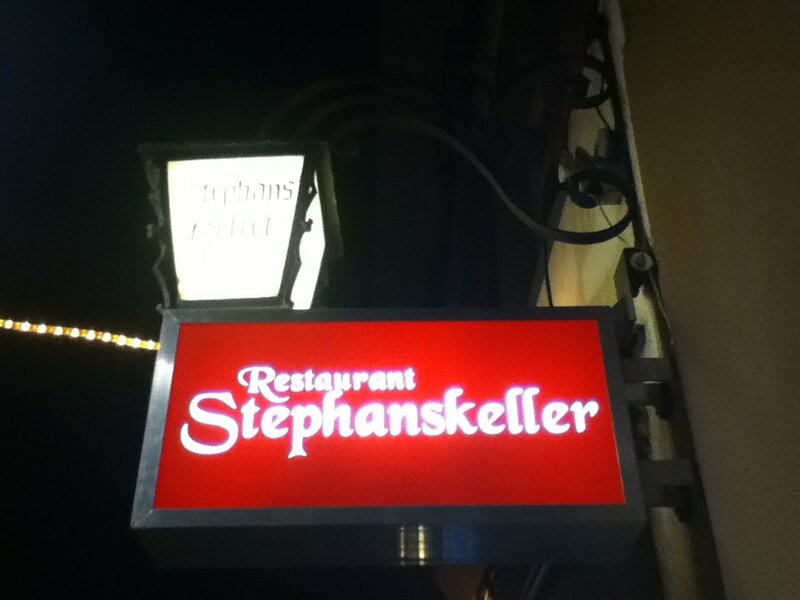 For dinner we headed to an old-style, wood-panelled tavern called Stephanskeller. 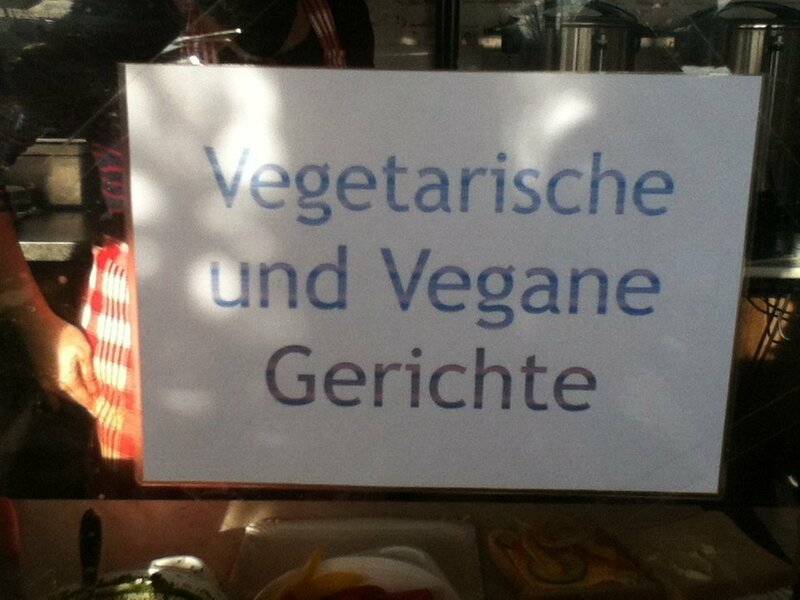 There is a separate vegetarian section on the menu, but most if not all of the dishes in that section contain dairy products. The house speciality, however, is pfannengerichte. Translated in the English-language menu as “pan meals”, these are essentially hot iron skillets filled with a number of meat and vegetable combinations. 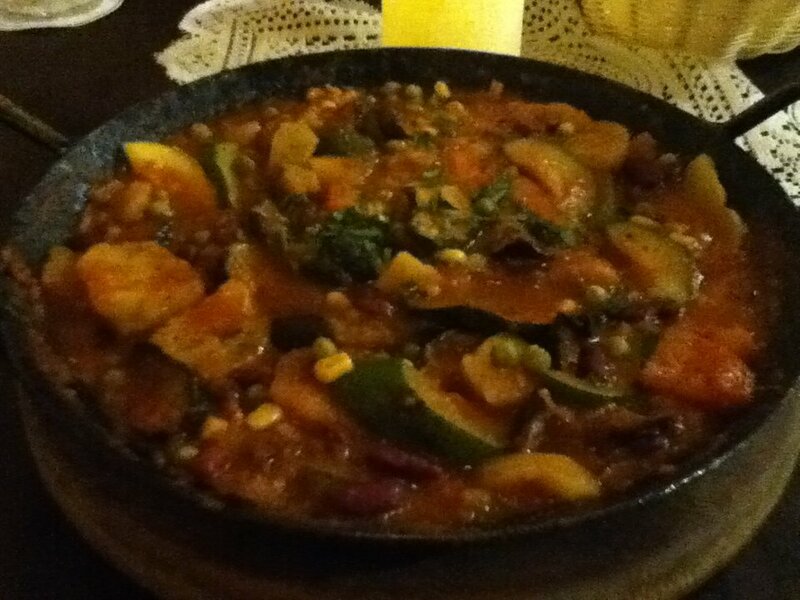 I ordered the vegetarian pan, which included eggplant, zucchini, onion, potatoes, black beans, peas, corn, peppers and tomatoes. Normally this is topped with a cream-based curry sauce, but when I explained that I don’t eat dairy products the waitress offered to make it with tomato sauce instead. It was hearty, filling and delicious! 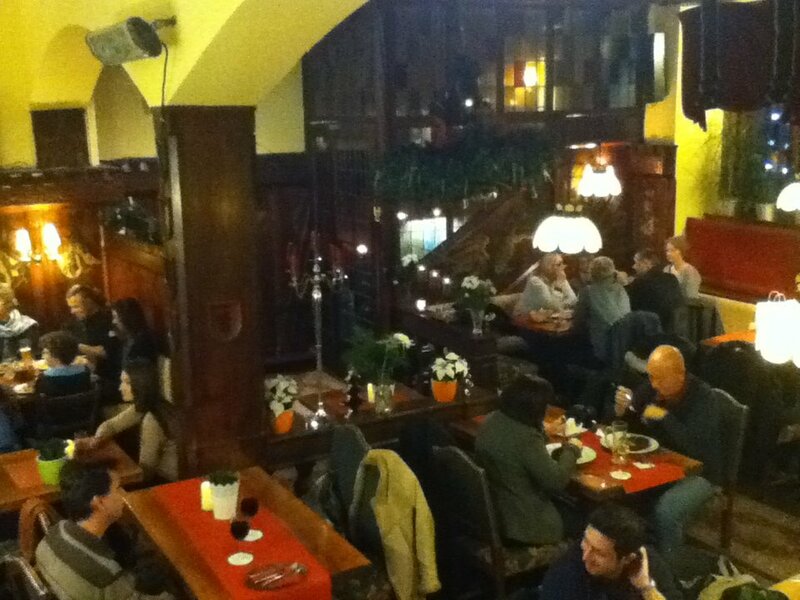 Even though this traditional German tavern is definitely not a place that caters to vegans, I honestly could not have asked for a better-tasting or more nutritious vegan meal. The setting was lovely too. Very cozy! The next morning, it was time for my first real oatmeal-on-the-road experiment. 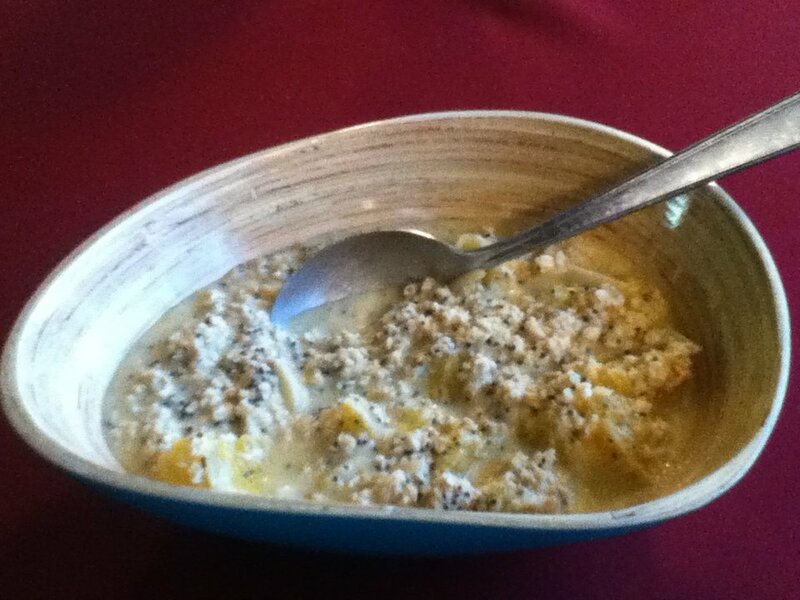 I had some oranges at home that I needed to use up, so I had decided to make Orange, Almond and Poppy Seed Oatmeal (also an Oatmeal Artist recipe). As it turned out, I could have grabbed an orange from the breakfast buffet the day before, but I had already brought my own. Since I didn’t have soy milk on hand this time, I thought I would try soaking the oats in orange juice. As you can probably tell from the photo, I used way too much orange juice. I’m still getting used to this overnight thing, and I keep forgetting that overnight oats need only half as much liquid as stove-top oats. Despite this rookie mistake, I was still quite pleased with the result! I think it’s safe to say that orange juice makes a tasty soaking liquid, particularly, for oatmeal recipes that feature orange as a main ingredient, and I’m eager to try out other varieties of fruit juice. Oh, and I’m also quite happy with my new oatmeal bowl (pictured above), which I picked up at the Christmas market. It’s made out of bamboo, so it’s very lightweight and also environmentally-friendly, as bamboo is a fast-growing plant that can be harvested sustainably. At home, during the week I bring my oatmeal to work with me, and I’ve been wanting an oatmeal bowl for the office so I don’t have to eat out of Tupperware anymore. Looks like my Christmas wish has been granted! Yes, that’s right. 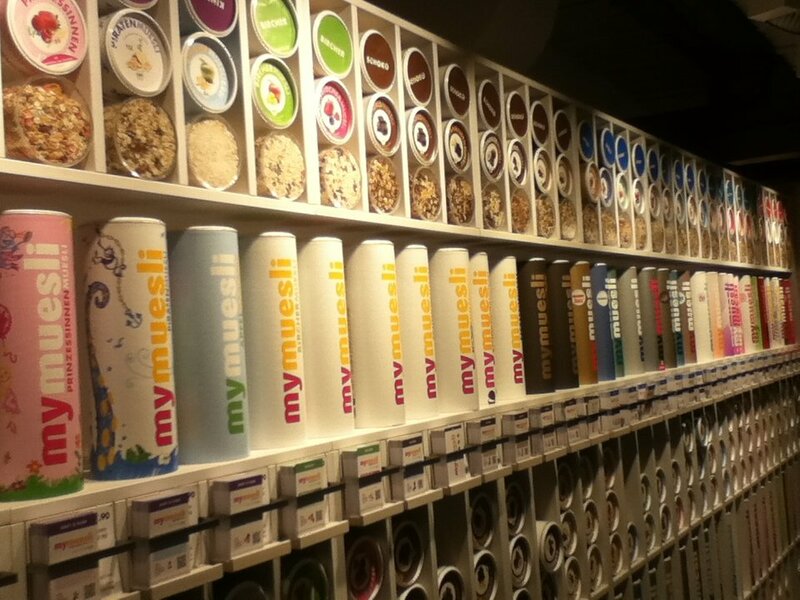 It’s a whole store that sells nothing but müesli. 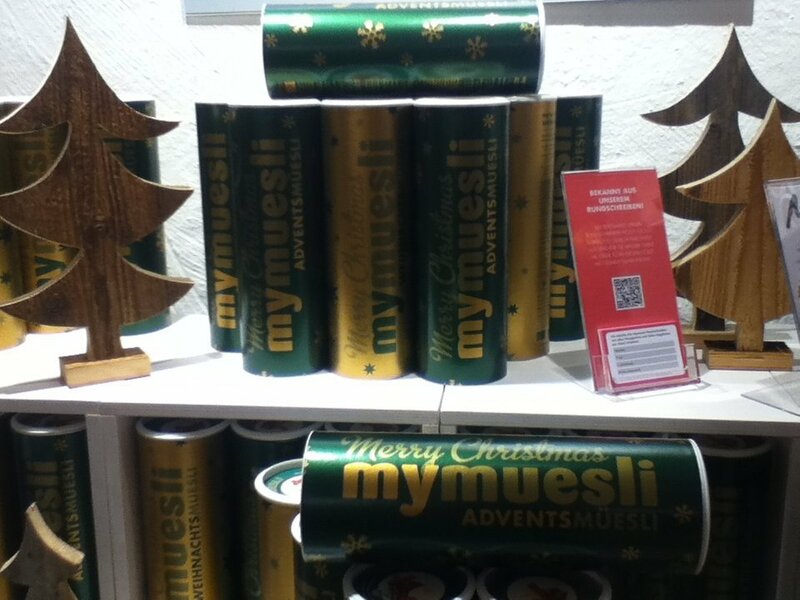 They even had a special Christmas müesli! While many of the varieties do seem to contain milk products in the ingredients list, their website helpfully includes a section that lists all their vegan mueslis. The friendly woman behind the counter said that four of the seven dishes were vegan or could be made vegan. 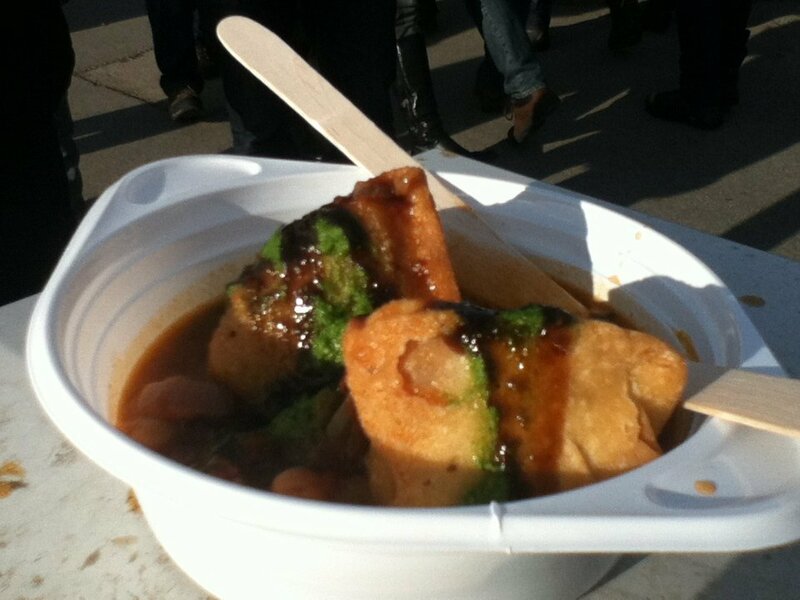 I decided to go with the samosa chat – an Indian street food snack that consists of two vegetable samosas covered in a chickpea curry and various chutneys. Yum! 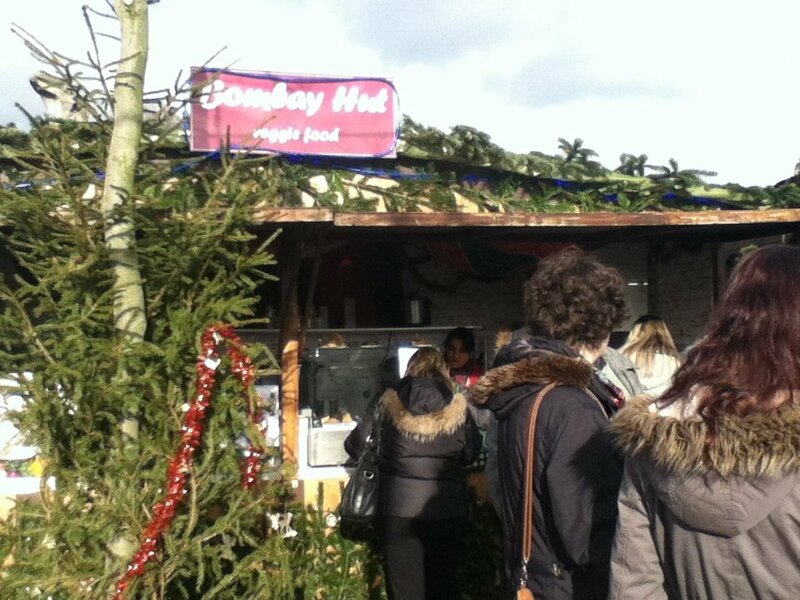 Apparently this is the first year that the Bombay Hut has participated in the Constance Christmas market, but they definitely plan to be back next year, so keep an eye out for them! And Merry Christmas everyone!